Centrifuge Machine is designed for separating blood and blood components from whole blood like platelet, plasma, RBC and Cryoprecipitate. 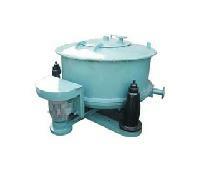 We make available Centrifuge Machine that is ideal for blood banks and hospitals. Our Centrifuge Machine is widely demanded by pharmaceutical industry, research centres, vaccine manufacturing industry and universities. We are a reputed Manufacturer and Supplier of Centrifuge Machine from Delhi, India. 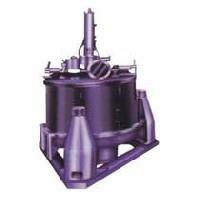 It is provided with stainless steel inner chamber and effectively insulated to provide sufficient cooling of the chamber. Our Centrifuge Machine comprises of CFC free refrigeration system with pre-cooling facility, maintenance free brushless induction motor with low level of vibration and noise with smooth acceleration and deceleration. It has electronic motorized door lock and facility to open in case of power failure, RCF, acceleration and deceleration time can be set as per user requirement. 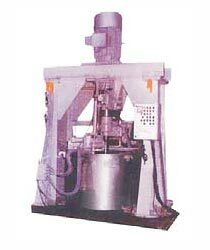 Imbalance cut off, safe door open and mechanical lid lock is provided for increased safety. The three point suspended - manual top discharge- MTD model is an universal centrifuge for all application of solidliquid separation by filtration. Offered in a variety of materials of construction like-austenitic steels, PVDF coated-mild steels etc. They are manufactured with the best technology in the field and gives long trouble free operational lite. These are offered in various models and known as Chemical Centrifuge & Vertical Centrifuge. Top driven bottom discharge for uses in Dexroth plant in starch unit. Top driven bottom discharge centrifuge for vertical high speed in basket. Scrapper unit & Brake arraignment with nuemuntic operated. Control panel in TDB machine. Fully Auto-PLC Control in GMP-Explosin / Flameproof execution. Full basket width? Two motion scrapper. Bottom driven Manual top discharge. 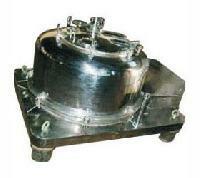 Fabricated outer body with Interlock safety cover. Dynamically balanced SS 304 / 316 inner basket. Bearing housing from graded C.I. with SS lining. Main shaft - En24, hardened and ground.